KawaiiPunk - Kawaii Mascot Blog: Scarily Stylish! Akumu Ink! 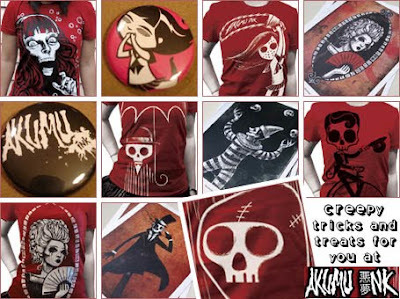 You see, not only are Akumu Ink the geniuses behind the Little Monsters, they also have their very own range of creepy tees that are just perfect for Halloween. How cool is that? So now, as well as dressing your kids up for Halloween, you too can get into the spooky spirit of things with your very own creepily cool clothing. Don’t say I never treat you!